A fresh and insightful account of the role played by sacred sites in raising human consciousness. Can a temple transform an ordinary person into an extraordinary being? Ancient texts across the world describe how, following a catastrophic flood, groups of enlightened individuals were entrusted with rebuilding the “former mansions of the gods” – a vast, interconnected network of temples and power places at “carefully chosen locations.” They also explicitly state how these sites would act as magical protectors for the people, “unfailingly and regularly and eternally,” and how each one embodies a spiritual technology designed and applied “for the welfare of all” – the only antidote to society falling into barbarity. In this ground-breaking book, researcher and best-selling author Freddy Silva examines the origins of sacred sites and what makes them so, from pre-diluvial ‘cities of knowledge’ to the resurgence of the temple via secret esoteric groups such as the Followers of Horus, even the architects of America’s capital. He reveals new evidence that temples mark geomagnetic hotspots capable of inducing shamanic states, validating the ancient belief that the sites are living organisms, first seen then felt. 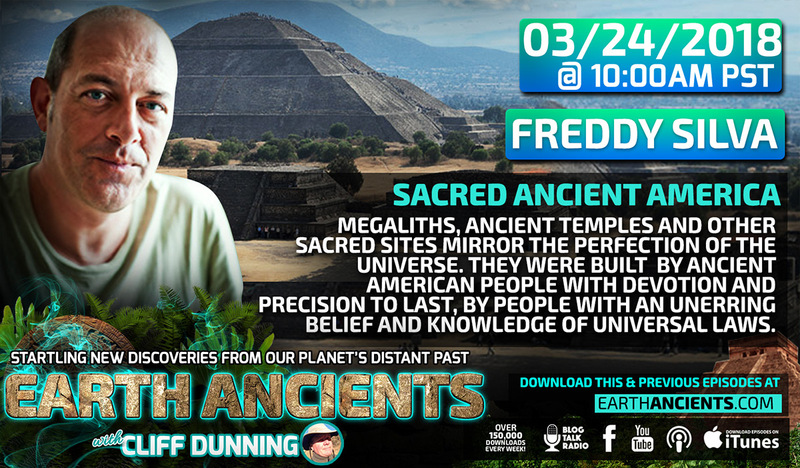 Freddy Silva is a best-selling author, and independent researcher of ancient systems of knowledge, alternative history, earth mysteries and esoterica. He appears on GaiaTV and The History Channel. His published works include: The Divine Blueprint: Temples, Power Places, and the Global Plan to Shape the Human Soul; First Templar Nation: How the Knights Templar Created Europe’s First Nation-state; The Lost Art of Resurrection: Initiation, secret chambers and the quest for the Otherworld; Chartres Cathedral: The missing of heretic guide; and Secrets In The Fields: The Science and Mysticism of Crop Circles.